Here you will find all of the news that we have posted. Just select the News Headline on the right or scroll down to browse. Check out Sonke's presentation about the 3 pillars of Silage Production. Sonke was a presenter at this year's Dairy Congress in London, which has had a focus on dairy education, the latest trends and newest technology. The presenation can be found here. We have done a lot of research on UAVs this year, unmanned aerial vehicle, also known as a drone to see the capabilities and uses of all different makes and models. It is no different than doing research on buying a new tractor, you have to make sure its features will fit with what we want it to do. 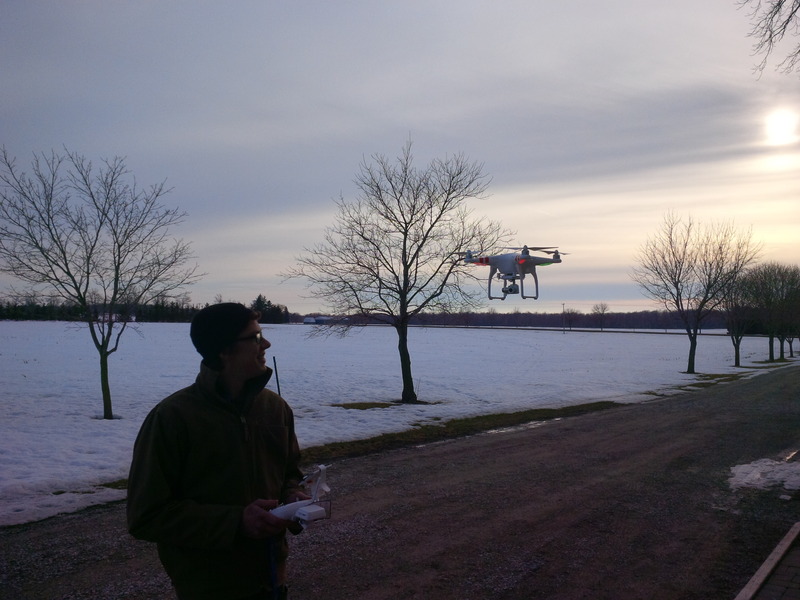 This past spring, we purchased a DJI Phantom 2 Vision Plus drone. It is a quadcopter that takes aerial images and videos. From this, we have learned so much about different farms, fields, crops and even equipment problems. In the early spring, we flew over some fields to see drainage problems and where we need to fix/add tile. We could see the planter misses and narrowed it down to individual row units that we need to fix over the winter. In the growing season, we could see fertiliy problems, variety splits, and fungicide trials. We used it as a tool to determine if we need to do a second application of nitrogen with the GreenSeeker. We also used it as a tool to help us plan the timing of corn silage. From the front of the field the corn looked ready to go, but using the drone we found that the back of the field was still too wet for corn silage. The 10 minutes it took to fly the field, saved us of the potential problems we could have had in the bunk if the crop went in too wet. We also used it to see manure spreader patterns. From the ground it was difficult to see what had happened to the crop, but from the air we saw that it was the manure spreader that had damaged the alfalfa. We have learned so much in one growing season with the drone. It has helped us make better and more informed cropping decisions this year, and to help plan for next year. We have also made some great videos with it this year too. If you haven't already, check out the video on the home screen. We hope everyone has had a safe harvest and that things are starting to wind down for you. We finished combining in great time this year, and most of the equipment is washed and getting ready for next year! So far this fall has ran fairly smooth. We had a couple of weeks with long days but we were able to get the corn silage off without too many major problems or breakdowns. With the nice stretch of warm weather we had during corn silage, the corn really dried down fast, making it a challenge to stay ahead and get the timing right into the bunk. In the end, the quality was good and everyone was happy with the harvest. With everyone’s cooperation, it all came off successfully! Beans had been coming off steady for a week, but now the weather has been holding us up. Yields have been decent depending on location. After talking with a few people, the general consensus seems to be that the timing of rain played a big factor in yields. This week does not look like a combining beans week. However, we are looking to start into some corn for high moisture corn shortly. It won't be long now until we are done! Wishing everyone a Happy Thanksgiving, even if you are harvesting! In a world full of technology, you would think that updating a website would be quick and easy – which it is. However, you can’t simply do it with a swipe of a finger or a tap of a button on your phone, like Facebook and Twitter. You don’t have constant updates dinging at you telling you to check the website or someone liked a picture. You actually have to make the time to sit at your computer and do the update, which is exactly what I am doing today. I’m going to work backwards through the year. Most of you likely want to know about what is going on now, not 4 months ago. Wheat harvest surprised us all! Yield was excellent and quality was great! The rain held off for us, so we were able to get a good majority of the wheat off before the first rainfall. What did we learn from wheat harvest? We did a few trials in our own fields, and one thing we are walking away with is the timing and amount of nitrogen. In order to use our GreenSeeker we need to do what we call a NRS – Nitrogen Rich Strip. This is the strip that has all the N upfront that we want to put on the field, which the GreenSeeker gets its numbers from and bases the later application amount on. We ourselves do 2 applications of N, one early and one 2 weeks later, but the NRS goes on in the first application when the wheat was just starting to green-up. This strip out yielded all the side-by-side trials in all of our fields. Thus showing us that we need to put more N on up front when the wheat is just starting to come out of winter. We will do more trials next year on this theory! Moving on to haylage… first and second cut are done and in the bunks. Lots of alfalfa and grass going into bunks and making dry hay. We are near the tail end of third cut and probably starting fourth cut soon. With this fall-like weather this week, it has slowed us down a little. But we will are revving up for the weekend to get a few farmers done! We have one harvester sitting, ready for corn silage to start, which isn’t too far away now. We will likely finish haylage around the same time we start up for silage! The late applications of nitrogen on the corn was a busy time. We can’t push the acres through the sprayer like we can when the corn is small, so this was a longer than usual process, especially when people started realizing their corn was running out of N. After 2014 applications and harvest, we learned that we needed to let the GreenSeeker do what it wanted to and not limit the N. This caused us to put more N on than anticipated, and I guess harvest will tell if this was the right thing to do. Driving around the country side, I think we made the right choice! Spraying crops this year went smoothly as well. I guess when you have around 33,000 ac on the sprayer for this year, you would hope it went smoothly! Besides the regular post application for weeds, we had lots of calls for fungicide applications on soybeans and corn, along with late nitrogen applications on corn. I am not sure if our timing was exact or if the weather cooperated with us, but we have seen limited white mould outbreaks in the soys this year. After such a wet spring, we weren’t sure how this was going to turn out. I have seen some white mould in the fields that were sprayed, but not nearly as much as what it could have been. But like I said, maybe the weather helped us out by warming up and stopping the growth of the mould. Planting crops this spring went well. We had almost all the corn in the ground in 2 weeks and the beans were not far behind. We had decent weather after, and the crops came up fairly even. Then we got frost in June. Thankfully we only replanted 50 ac of soybeans and the corn fields bounced right back. Then we got some rain, and lots of rain! Which for most crops wasn’t too bad. However, if the soybeans were planted on the deeper side, we saw some emergence issues. Those that were lucky enough to emerge, then got hit by phytophthora root rot. With higher seeding rates, yield shouldn’t be affected too much. Once mid-July hit, we finally got summer weather - which brought on aphids and spider mites in the soys. There, I tried to keep it short! But when you haven’t done an update in a few months, then it may be longer than usual. I hope the next one isn’t nearly as long – in length and time in between updates! If you haven’t checked out the wheat harvest video yet, please do! It’s a good one! If you are reading this, then I am sure you have checked out the new, updated look of the website. I realize there are still a few pages that are not up and running yet, but we are working on it. If you have any comments regarding the new website, or there are items missing you would like to know more about, please let us know. You can email me, or feel free to leave us a message on our Facebook page. Here we are, nearing the end of November and still have a fair bit of work to do in the fields. We have around 1200 acres left of corn still standing in the fields and tillage work that needs to be done. We have been able to break in the new plow nicely, with about 1100 acres under our belt. This rain and mild temperatures we have had this past weekend and today have not helped the combining situation. We were able to slowly get some acres knocked off last week when there was still snow on the ground, but this thaw put a halt to things over the weekend. We hope with the colder temps coming near the end of the week, that we can get back into the fields. With this being said, we warn everyone to take caution when driving on the roads in icy and snowy conditions. Please be safe out there! As I sit here on this overcast, drizzly afternoon, I thought I would send out an update on where we stand now in the middle of October. Not much has been done around the country side these last few days, but we are grateful for the stretch of nice weather we had over the Thanksgiving weekend to allow us to get a lot of work done. Currently, we are just wrapping up corn silage and are just shy of having 40% of the soybean acres off. This being said, we still have a way to go to get some more winter wheat in the ground. Spraying is coming to an end shortly and tillage is just beginning. Our goal for the next few weeks is to keep the combines moving. We would like to get the IP soybeans off before switching to round up ready soys. It is easiest to combine IP soys first to avoid possible contamination and to avoid lost time of cleaning out the combines. That being said, we also need to keep the drill going with planting wheat. We will focus of the soybean fields first that have winter wheat being planted after harvest. We would also like to get tillage started. 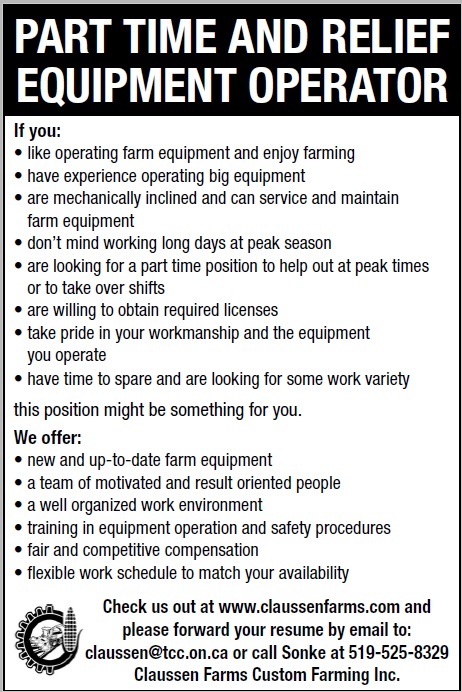 Once you think a field is ready to call, do not hesitate to call. We can get this scheduled in and get it done as soon as possible. We hope the Farmer’s Almanac is wrong, but we are looking at getting snow early this year and more rain. We want everyone to be prepared for not-so-perfect conditions in the field and on the road. 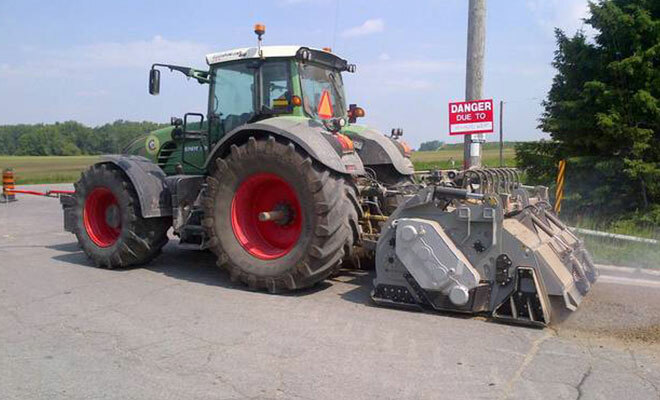 Clients need to be prepared for ruts in the field and messes on the road. We need to keep an eye on this and work together to keep the road clean and safe for everyone! Sonke is the main contact for scheduling (519-525-8329). You can call or text – leave a message and he will get back to you. Other contacts are: Doug (519-525-3755), Hauke (519-525-7733) and Erin (519-955-6344). The entire team here at CFCF Inc. will do whatever is possible to get your jobs done as best as we can. I am confident that with good communication, preparedness, common sense and cooperation we will manage this season and we will all be proud once it is all done! Our goal is to get the job done right but more importantly we want to make sure everyone is safe! What's NEW at CFCF Inc.? We are happy to announce that we are going to be seed dealers for two new companies, General Seed and Huron Commodities Inc.
For General Seed we will be carrying their cover crops. These include Hairy Vetch, Crimson Clover, Austrian Winter Peas, Nitro Radish, and more. We will carry Huron Commodities Summit Genetics seed. Such varieties include the HC 06-17, Chikala Nattos, and a few more. For further information regarding either of these two dealerships, do not hesitate to call Hauke (519-525-7733). For both companies, we will only order in what is needed. We will not carry a stock supply as of yet. It’s that time of year again to start thinking about spraying corn with fungicide! The optimal timing is when the corn is tasseling, which is getting close! In the past, we have seen that land vehicle application is getting the highest yield results, followed by helicopter as the next best choice, where as airplane application has not shown good results. The sprayer is converted for minimal crop damage. The changes made include: belly pan and tarp, hood guard, wheel hub covers and the fenders have been removed. A boom lift kit is installed for 10 ft of clearance under the boom. The sprayer follows the same tracks and headland cycles as used at previous spray applications (when sprayed by CFCF). Test plot results over the past years are variable from 0 additional bushels to over 20 bu/ac. Varieties that show good leaf health are showing less of an advantage. On average, the monetary advantages are better than breaking even. Silage varieties seem to take additional benefits from the stay green effect with consistent yield gains! Last year about 40% of all corn acres we are looking after, were sprayed with fungicide at tassel. Call Sonke (519-525-8329) for further details or to let him know you want to spray!! Check out the video on YouTube from last year. Notice there is minimal damage done to the standing corn! FAE MTH-250 Road Machine is finally here! So far expectations are met at the first project. The machine produces a very fine end material which can be adjusted on the go. The shop made road transport float also did its job and needed just a few modifications.